archive.is Email No (“If you reside in Albania”) Minimal information buried in a multi-topic page. Directs readers to Bureau of Consular Affairs site for more information. archive.is Telephone Extremely short & uninformative page without even a BCA link for more information. archive.is Not specified Only major page devoted to renunciation is about Selective Service, and does not explain appointment procedures. The A-Z Subject Listing (archive.org; archive.is) has an entry for “renunciation of citizenship” with a broken link (even when you remove the “mailto”, it’s still wrong). archive.is Email No Serves residents of Antigua & Barbuda, Dominica, Grenada, St Kitts & Nevis, St Lucia, and Saint Vincent & Grenadines only. archive.is No online booking Main “loss of nationality” page is short & uninformative, does not tell you how to get an appointment, demands you email them if you want details, and directs readers to BCA site for more information. Appointments page (archive.org; archive.is) warns that bookings can’t be made online. archive.is Email only, no online booking Information buried in multi-topic page. archive.is Telephone or email “You may need to fill out forms as follows (5 copies for each form)”. Says you should fill out DS-4083 (the actual CLN) yourself. archive.is Not specified Minimal information. Directs readers to BCA site for more information. archive.is Not specified Only explains Section 349(a), does not explain how to get an appointment or what their procedures are. archive.is Email No details on procedures, demands you send an email to get any information. archive.is Email (to worldwide State Dept. address) “All Renunciations are processed in Frankfurt”, despite that there are three other U.S. posts in Germany. archive.is Online (“notarial and other services”)? Passports & Citizenship page mentions renunciation, lists it under “By Appointment Only” services, says “click on the link to make an appointment”. Links for some services (e.g. “Data change or correction of passport”) go to forms which then link to the online booking system, but the renunciation link just goes to the BCA site, which doesn’t tell you how to make an appointment in Guatemala. archive.is Telephone or email Minimal information buried in a multi-topic page. Directs readers to BCA site for more information. archive.is Don’t call us, we’ll call you Says you must mail or e-mail them the completed forms (including a DS-4083, the actual CLN itself), then they will contact you five days later to schedule a phone interview, then another in-person appointment. archive.is Email “Renunciation interviews are only conducted at the U.S. Embassy in Kingston, Jamaica. The Consular Agencies are unable to assist with renunciations.” Directs readers to BCA site for more information. archive.is Online inquiry form “If you wish to request an appointment for an initial counseling, please indicate at least three preferred appointment dates. Appointments are available only on Tuesday and Thursday afternoons at 14:00, excluding Japanese and American holidays.” The page on Loss of Nationality does not mention the word “renunciation”, only “renounce”, so the internal search engine, which doesn’t do stemming, won’t find it on a query for “renunciation” (archive.is). The A-Z Listing of Services (archive.org; archive.is) only links to the BCA site, not the local Loss of Nationality page. archive.is Email Minimal information: “Please note that it takes at least 6 – 8 weeks to receive the approval of a renunciation from Washington. The Embassy will hold your U.S. passport during this period.” Directs readers to BCA site for more information. archive.is Email Minimal information buried in multi-topic page, without even a BCA link for more information. archive.is Not specified Minimal information buried in “Dual Nationality” page. Instructs applicants to contact an embassy or consulate for renunciation, but does not specify how to make an appointment. archive.is Email, no online booking No further information about renunciation on individual consulate pages (Ciudad Juárez, Guadalajara, Hermosillo, Matamoros, Merida, Monterrey, Nogales, Nuevo Laredo, Tijuana). archive.is Email Post-specific renunciation questionnaire implies that first appointment of dual appointment system is optional? archive.is Email “Priority … to applicants who reside in Myanmar” “The initial interview is followed by a period of reflection before the second interview will be scheduled”. archive.is Email No American Citizens Services are provided at the embassy in The Hague. Amusing sidebar: “As tax obligations are sometimes a factor in considering renouncing U.S. citizenship, it may be useful to know the United States and the Netherlands signed an intergovernmental agreement to implement the Foreign Accounts Tax Compliance Act (FATCA)”. archive.is Not specified “This second interview allows individuals to reflect on the very serious act of losing U.S. citizenship. This step is required by law and cannot be skipped, accelerated, or omitted.” The statute does not require this and the Foreign Affairs Manual is not law or even regulation. archive.is Telephone or email Minimal information buried in “Dual Nationality” page; directs readers to BCA site for more information. archive.is Telephone or email “On your first visit, you must come in person with your U.S. passport any Thursday afternoon 2-3pm … Chinese-language renunciation is only available on the first Thursday of the month whereas English-language renunciations will continue on a weekly basis.” Also has separate page on how to give up a green card. archive.is Email “The renunciation process requires two separate visits that are at least 48 hours apart”. The Chiang Mai consulate seems not to handle renunciation (no mentions of it on their website). archive.is Not specified. Only explains Section 349(a), does not explain how to get an appointment or what their procedures are. archive.is Email Minimal information buried in multi-topic “Frequently Asked Questions” page.No mention of renunciation on the website of the embassy in Abu Dhabi. The below table lists 124 posts whose webpages don’t contain any detailed information on renouncing U.S. citizenship nor any mention of how to make an appointment to do so. Links go to search results for the word “renunciation” showing no relevant results at the given embassy or consulate website. Only archive.is links are provided in the “archive link” column, as archive.org can’t save these search result pages. This table does not include countries where the U.S. does not have an embassy at all and relations are handled by a non-resident ambassador accredited to two or more countries (e.g. Andorra, Bhutan, Guinea-Bissau, etc.). Belarus Minsk archive.is search.usembassy.gov “renunciation”. Main page says Belarus made them cut down the embassy to six staff members, so they probably cut out a lot of services. Fiji Suva archive.is search.usembassy.gov “renunciation”. Embassy Suva also covers Kiribati, Nauru, Tonga, and Tuvalu. New Zealand Wellington archive.is search.usembassy.gov “renunciation”. The US Citizens Services (archive.is; archive.org) and Apply for a Passport (archive.is; archive.org) pages have a link to the BCA site on renunciation, but do not give any information about appointment procedures. Nicaragua Managua archive.is search.usembassy.gov “renunciation”. Sole result is a American Citizens Service Assistant job ad (archive.org; archive.is) which mentions renunciation cases as one of the responsibilities. Moresby archive.is search.usembassy.gov “renunciation” (sole result is mention of fee hike). Consular district also includes Solomon Islands and Vanuatu. Sri Lanka Colombo archive.is search.usembassy.gov “renunciation”. Consular district also includes Maldives. Syria Damascus archive.is search.usembassy.gov “renunciation” (sole result is mention of fee hike). Embassy has been closed since February 2012. Now I’m just an old lady and I don’t pretend to be the brightest crayon in the box but if the goal here is to “break even” then they are looking at this all wrong. Read the outline of the procedure again. Does that sound efficient to you? Just the assumption that any US citizen showing up to renounce his US citizenship doesn’t really understand what he/she is doing and has to have it explained ad nauseum (intensive interviews?) and then be sent off to a corner like a little kid to reflect on it before being allowed to come back and do the deed, is just ridiculous. Right there I’d say just treating people like adults and assuming that they do know their own mind would save a lot of time, money and hassle all around. And the narrative that will come out of this fee raise is not likely to focus on “cost recovery” at US consulates around the world but on what is going to be perceived as a punitive act on the part of the US government. It looks like they are so embarrassed by the renunciation numbers and the lines to renounce at the US consulates that they are looking for ways to reduce or slow down the demand. Think about that. Has the state of US citizenship in the world really come to the point where the US government thinks that Americans have to be actively discouraged from renouncing? That is what people are likely to take away from this news. That the United States is trying to keep it’s citizens captive by finding quasi-legal methods to interfere with their right to expatriate under international law. The State Department later claimed that all of the rigamarole they let each consulate add to the process, not to mention the obscene fee, “does not impinge, but rather protects, the right of expatriation”. What this really seems to mean is that State seized on a few examples of people who didn’t know what they were doing or who were trying to throw sand in the gears, and used that as an excuse to treat the rest of us like delinquent children and force us to subsidise the time spent on those other cases. Don’t you love paying taxes & fines for this kind of “protection” from the United States? At least in the beginning, what we found out was that one could renounce/relinquish at ANY consulate. There is no rule that says one is restricted to the locale where one resides. Though practices at particular consulates seem to be uneven across the board. @Norman Diamond: the 4 months seems to be the time until getting the CLN (“until receiving final approval”, as the article puts it), but it’s not clear when they started counting that four months: from the time of the first appointment, or from the time of trying to book a first appointment. Amazing job doing all the research and putting the above table together. 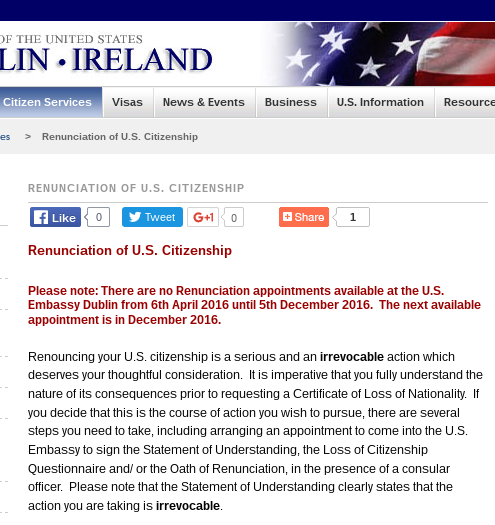 U.S. Embassy Dublin has moved their renunciation page to a new location. The message about “no appointments until December” has been removed. Not clear whether they are actually offering more appointments, or just hiding the bad news after it drew attention. In any case, at least we’ve got archive snapshots of all those pages. No DS-4079. Was this the case before? After I read your post yesterday, and looked at Dublin’s website and found no DS-4079 required, I wondered if there might be a general change of practice afoot, with Dublin being an early adopted. But apparently not. It was just my mistake. Thanks for clearing it up for me. Over on the big renunciation thread, Dave says he e-mailed the U.S. consulate in Toronto five months ago (i.e. around March 2016) and just got a reply from them in August 2016 giving him an appointment in January 2017. Ten months from initial contact to appointment. WTF. Layoffs at the State Department. Dunno whether it will affect appointment availability. The Philippines only gave dual citizen government employees a six-month window in which to renounce their other citizenship. That’s not even enough time to get an appointment at many US consulates.